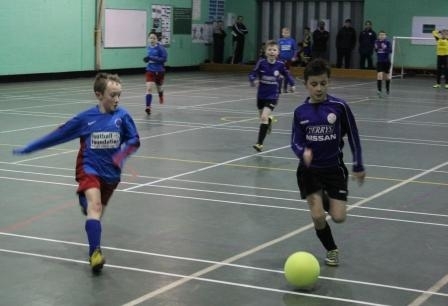 On Friday evening Westholme School hosted Round 1 of the annual under 11 5-a-side indoor football tournament. We welcomed six teams: Salesbury, St. Thomas (Barrowford), St. Leonard’s (Langho), Harris, QEGS and St. Francis who competed against each other to try and secure a top three spot and qualify for the finals. All teams played extremely well and the standard of football was high. Parents and team mates cheered on from the sidelines as tackles were made and goals were scored. After all matches finished, the players, along with their travelling support, gathered in the Learning Resource Centre for team teas – pizza, sausage and chips hit the spot for everyone! Mr Lewis then announced the results. Congratulations went to the top 3 teams: Harris Primary School, St. Leonard’s Langho and Salesbury. We look forward to seeing you compete in the finals on the 7th February. On Friday, we will welcome another selection of teams who will compete for the top three places and aim to qualify for the finals! Special thanks to all the teams who have competed so far. Well done also to St. Thomas’ Barrowford, QEGS and St. Francis, who narrowly missed out on qualifying. We hope to see you again next year. Thank you also to our team of referees and to Mr Kevin Gallacher for such a wonderful event.